There were several high-ranking military officers in Military Region II. The Region’s Commander was Maj. Gen. Vang Pao from 1962 until May 14, 1975, when the Pathet Lao seized power. Gen. Vang Pao immigrated to the US and died in that country on 6 January 2011. Gen. Vang Pao had two deputy-commanders, one lowland Lao deputy and one Hmong deputy. Brig. Gen. Tiao Monivong Kindavong was the lowland Lao deputy from 1968 until 1973, when he was reassigned to Vientiane. He was the second son of Tiao Kindavong, a member of the Vang Na royal lineage. His replacement, between 1973 and 1975, was Col. Anamay, a low Lao officer. The second deputy-Commander was Col. Neng Chue Thao, a highland Hmong native. Photo# 112 Maj. Vang Pao in January 1961, at the top of Pa Dong Mountain. He named this site LS05 and used it as the regroupment center for armed forces to fight against the Lao and Vietnamese communists and the Lao neutralists who had just captured Xieng Khouang Province. 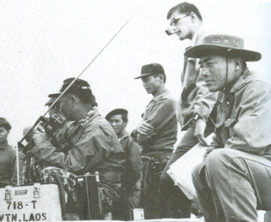 Photo# 113 Maj. Gen. Vang Pao in 1973, as Commander of MR-II. When the Pathet Lao came to power, Brig. Gen. Tiao Monivong was named Commander of MR-II, replacing Gen. Vang Pao who had left for Thailand. Brig. Gen. Tiao Monivong stayed with the Pathet Lao but could not work with them too well, left the country for a while before he was arrested and sent to a re-education camp. He was released in early 1992, chose to self-exile in France by the end of that year, and later died on October 4, 2005 in Bordeaux, France. As for Col. Anamay, after the communist take-over, he immigrated to Australia where he passed away. Photo # 114. From left to right: Niam SongMua, Me La, Gen. Vang Pao, and Niam Ntxhiav Thao (Niam Ntxhiav Thao, died in 2007 in California ). Photo taken in 1973 at Pak Khe. Photo #115. Gen. Vang Pao with his family in 1971 at Long Cheng. From left to right: 4 children on the front row: Ying Vang, Chareunesouk Vang, Mayka Vang & Maykia Vang. 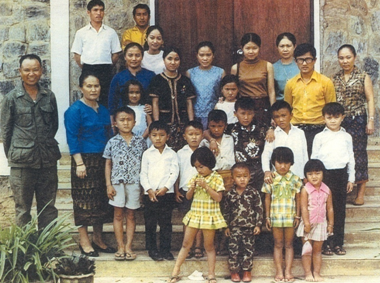 Second row from left to right: Gen. Vang Pao, Xia Thao (Gen. Vang Pao’s wife), Sisouk Vang, Cha Vang, Chai Vang, Ze Vang, Somsanouk Vang, Lu Vang, & Vanou Lyfoung (Tougeu Lyfoung’s son). Third row from left to right: Chia Moua (Gen. Vang Pao’s wife), Kia Vang in front of her mom, Nang Lay Vang, Me Lab (Gen. Vang Pao’s wife, remarried after she came to the USA), May Kao Vang, May Kao Lyfoung (Francois’s wife), Nang Sisamone Lyfoung (Tougeu Lyfoung’s wife), Mr. Francois Vang, Pai Lor (Gen. Vang Pao wife, separated after arriving in the USA. ).Last row with threepeople from left to right: Chu Vang (Tswb Vaj), Pao Vang and May See (a nurse to care for Gen. Vang Pao’s family). Remark: Xia Thao (or Ntxhia Thao) died in 2007 and Chia Moua (or Txiab Mua) died 8/22/2009 in California. He was the Hmong deputy-Commander of MR-II. During 1950-1954, as a member of the French Army, he fought the war against the Communists in Indochina. He was also Gen. Vang Pao’s brother-in-law. He attended the military school in Dong Hene in 1952 and became sergeant upon graduation. He fought the Vietminh along with Lt. Vang Pao during 1953-1954 (until the beginning the US war in Indochina). As commander of Battalion 2, he once attacked the Vietminh at Nonghet. During 1961-1965, he was the Commander of Regiment BV 21. From 1965 to 1973, he was the military advisor of MR-II. During 1973-1975, he was deputy-Commander of MR-II. He immigrated to Texas, USA where he passed away in 1995 due to old age illness. From1961 to 1964, LyTou Pao was Gen. Vang Pao’s assistant. From 1964 to 1969, he was the Chief of Staff of the Joint Operation Center (JOC) of the Special Guerilla Units (SGU) in Military Region II (MRII). From 1969 to 1975, he was the commander of the Xieng Khouang military sub-region. On May 14, 1975, he immigrated to France and, in 1984, moved to the US where he lives in California. Photo #116. 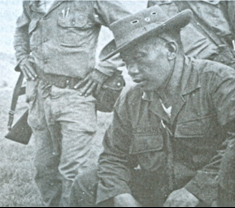 Col. Youa Va Lee (with big hat) fought the “Honor Restoration” war in 1970 in the Plain of Jars under the command of Gen. Vang Pao (holding the radioset). Also shown on the photo was Tiao Mangkhala, Prince Souvanna Phouma’s son (with big pipe). In 1953, Youa Va Lee was the Commander of Hmong Parachutists Battalion who led the French regiment in the pursuit of the Viet Minh in Muang Ngat and Muang Mork in eastern Xieng Khouang Province. He remained in the French Army until 1954 ans was of the same officer graduating class as Col. Neng Chue Thao. In 1961, he became Commander of the First Battalion responsible for the security of Long Cheng. In 1966, he became military advisor to Gen. Vang Pao and, in 1975, immigrated to southern France where he died in 1982. From 1961 to 1962, Col. Shoua Yang was the Commander of the Second Battalion and, during 1962-1964, was in charge of Zone 11 and Commander of Battalion 24 at Sane Chor (LS02). During 1965-1968, he was named military advisor of the allied troops stationed at Phou Pha Thee (LS85) and the Houaphan sub-military region. In 1969, he was named MR-II Chief of Staff but resigned less than a month later for lack of training. Since that time, he did not get any significant assignments except for the position of military general inspector of MR-II until May 14, 1975 when he immigrated to France, where he died on April 12, 2007. From 1968 to 1975, Col. Kham Houng was the Chief of Staff of the Lao troops in MR-II. He immigrated to France and died in Paris due to illness. From 1961 to 1967, Col. Nhia Xou Yang was Commander of Battalion 203 at Phou Fa-Phou Vieng. He led his battalion in several battles in the Plain of Jars, and was in charge of military reorganization of MR-II. In 1970, he asked to be put on leave of absence and, in 1975, immigrated to the US where he now lives in Minnesota. From 1968 to 1969, Yong Chue Yang was the commander of Battalion 201 stationed in Ban Na (LS15) and later replaced by Col. Toulong Yang. During 1969-1972, he was the military advisor of MR-II. In 1972, he was for three weeks the acting Commander of Division II for Col. Vang Geu, with the command center located on top of a bare mountain between Phou Bia and Phou Pha Xay. Col. Yong Chue Yang coordinated with the Commander of Regiment 33 (Col. Boualiane, who came from MR-III in Savannakhet) in instructing T-28 pilots to drop bombs on enemy positions near the allied post of Phou Pha Xay. The bombs were dropped on the wrong positions, and hit Regiment 33’s Battalion 3 instead, causing some fatalities and injuries. The error was in part caused by the steep mountain that made it difficult for the pilots to see their targets. Besides, the enemy was also firing anti-aircraft shells to the north and west sides of the mountain. Therefore, rather than dropping one bomb at a time, the pilots dropped all six of them at the same time. Col. Yong Chue Yang immigrated as a refugee to Wisconsin, USA and died there in 1992 from natural cause. From 1961 to 1968, Col. Nhia Lue Vang was commander of the military base at Phou Saboth, north of Ban Bane-Muang Kham, which was lost to the enemy in early 1970. The base was later regrouped as Battalion 228 under the command of Lt. Col. Vang Kua, who led that battalion in supporting MR-IV’s attack of a communist post in Paksong, Champasak Province. That post was attacked several times by the MR-IV troops but unsuccessfully. Lt. Col. Vang Kua was able to seize two mountain positions in MR-IV, making Gen. Soutchai Vongsavanh, Prince Boun-Oum Na Champassack and several MR-IV leaders very happy. Col. Nhia Lue was an advisor to Lt. Col. Vang Koua and MR-II until 1975, when he immigrated to the refugee camp of Nam Phong, Khon Kene Province, Thailand. He died at the camp that same year from malaria. As mentioned earlier, in 1970, Lt. Col. Vang Koua led Battalion 228 to reinforce Military Region IV (MR-IV) to liberate Pak Song with good success and was well recognized by Gen. Soukchay Commander of MR-IV and the people of Pakse Province. Col. Vang Koua died in North Carolina USA on October 4, 2002. He was killed by his son–in-law during a family dispute. From 1961 to 1965, Col. Tou Long Yang was the commander of Phou Nong Phi camp, west of Phou Fa – Phou Vieng. He served as officer liaison with Military Region I for several years, immigrated to France then to the USA, where he now lives in Michigan and runs a fairly large restaurant business. From 1952 to 1960, Col. Tou Lu Mua was the chief of the Hmong district of Phou Dou. From 1961 to 1967, he served as the MR-II’s Financial Officer working directly under Gen. Vang Pao. In 1967, he was replaced by Lt. Col. Vang Neng and, during 1967-1969, became Chief Military Inspector of MR-II. During 1969-1975, he served as lead-secretary and military advisor to Gen. Vang Pao with his deputy, Lt. Col. Mua Kao. Col. Tou Lu Mua immigrated to France and, in 1989, came to the US to resettle in Colorado. Because he did not have adequate medical insurance coverage, he went back to France in 2007. From 1950 to 1963, Col. Wa Seng Vang fought with the Neo Lao Hak Xath against the French in the Muang Mork area (LS46). In 1963, he chose to fight with the allies, knowing that Gen. Vang Pao was the Commancer of MR-II. In 1965, he attended military officer school in Long Cheng and was later appointed Commander of Battalion 2. In 1968, he was seriously wounded and was put on sick leave. During 1968-1975, Col. Wa Seng Vang served as military advisor in Military Region II until the day he immigrated to Wisconsin, USA. From 1961 to 1968, Vang Thai was Commander of Battalion 211. From 1969 to 1975, he was Commander of MR-II Training Center and, on May 14, 1975 immigrated to California, USA. From 1975 to 2005, he was President of Hmong-Lao Veteran Association, Inc. in the USA. In 1959, Ly Xang graduated from the Teacher’s College in Vientiane and taught at a primary school in Phonsavan during 1960-1961. Because of the political changes in the country, he enrolled in the Royal Lao Army and was later appointed training officer at several military camps to get troops well prepared for the fight against the enemy. In 1968, after Houaphan Province fell to the enemy, Col. Ly Xang went back to serve at positions behind the front line. In 1975, he immigrated to California, USA. He later took a trip back to Thailand and died there on August 25, 1995. His body was brought back to the USA and buried in Saginaw, Michigan next to the tomb of his wife (who died in 1983). Ly Xang was the son of Chao Muang Tong Pao Lee, a native of Ban Nam Kanh, Nonghet, near the important French military camp of Phan Nieng (that was established during the Vietminh era). In 1952, the Vietminh fiercely attacked Phan Nieng Camp in order to seize Nonghet. Hundreds of them died during the attack. Chao Muang Tong Pao performed very well for the French. In 1975, he immigrated to France to live with his daughter-in-law, the second wife of Col. Ly Xang, and a native of Pakse by the name of Nang Boutsady. Chaomuang Tong Pao died in France in 1984. From 1968 to 1975, Col. Xay Dang Xiong was Commander of the training center with Col. Vang Thai. He was a well disciplined and strict officer. He immigrated to Milwaukie, Wisconsin, USA, and now lives in Florida USA. Col. Ly Teng is Gen. Vang Pao’s brother-in-law. In 1961, he served as an officer with Volunteers Battalion 21. From 1961 to 1962, he went on military and leadership training in Thailand. From 1963 to 1965, Ly Teng was Commander of SGU Battalion 202. In 1966, he became chief of the training center in Long Cheng. From1966 to 1968, he served as officer liaison in the capital city of Vientiane. During 1968-1969, he was the Chief of the Third Bureau working on plans to recapture Phou Pha Thee (LS85) with duty station in Long Cheng. 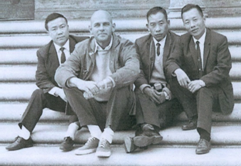 During 1970-1971, he received a military staff training course in Vientiane, taught by a French instructor. During 1971-1972, he served as chief of staff of the Joint Operation Center (JOC) for MR-II Logistics. From 1972 to 1973, he was Commander of SGU Regiment 23. From 1973 to 1975, Col. Ly Teng was MR-II deputy-chief of staff responsible for logistics. He immigrated to Thailand on May 14, 1975 and, in 1976, to Minnesota, USA. Col. Ly Xee Blong Lyfoung was an officer of high rank in Military Region II (MR II) during the two wars : the French War and the US War in Indochina. He also served as a coordinator between General Vang Pao and son excellence Phagna Damronglithikay Touby Lyfoung. Col. Ly Xee Blong was then refugee in France and passed away in 1982. Col. Ly Xee Blong was the son of Ly Pao Ge, Touby Lyfoung’s older brother. Ly Pao Ge died by accident while horse riding. As Hmong culture dictates, Touby Lyfoung then took Ly Pao Ge’s wife as his own..
Col. Ly Nao Kao was the third son of Mr. Lyfoung and his third wife, Nang Kue Chua, all of whom were from the Keo Park Kha Hmong family living in the eastern part of Xieng Khouang Province, close to the Laos/North Vietnam border. From 1953 to 1954, he served as a French soldier assigned to the Hmong Parachutist Battalion in the pursuit of the Vietminh to Nonghet. From 1961 to 1969, he was the Commander of Artillery Battalion in Military Region II (MR-II), a position assumed by Lt. Col. Yang Chue in 1969. From 1969 to1975, he was the military advisor of MR-II). He immigrated to France and then to Minnesota, USA. He died on May 5, 2010 in Minnesota. Col. Mua Su, the son of Col. Cheu Pao Mua, served as MR-II representative in the Sayabouri, Louang Namtha, Nam Gnou and Luang Prabang operational areas. He used to attend Military Staff Training at Long Cheng. During 1972-1973, he replaced Col. Ly Tou Pao as SGU Chief of Staff in MR-II. Between 1973 and 1975, he was appointed Commander of Division II responsible for military security in the Sala Phou Khoune area, near the junction of Highways 13 and 7. His deputy was Lt. Col. Vang Neng. Col. Mua Su immigrated to Thailand and did not go anywhere else. From 1967 to 1969, Col. Tong Wa Lor was Commander of Battalion 221 that occupied Nam Mai Camp near Hine Tang (LS74). He was killed in Hine Tang in 1969 during a Vietminh attack. From 1950 to 1954, Ly Pao was a French soldier serving in the Hmong Parachutist Battalion led by then Sergeant-Major Youa Vang Ly in the pursuit of the Viet Minh from Muang Mork to Nonghet. In 1959, Maj. Vang Pao ordered Capt. Ly Pao to pursue the Pathet Lao troops that fled from the Plain of Jars under the command of Lt. Col. Tou Ya. His battalion caught up with the Pathet Lao troops and was engaged in a short fight near Muang Mork. From 1963 to 1967, he was named regional field Commander at several operational theaters in Sayaboury, Luang Prabang and Luang Nam Tha. In 1975, Col. Ly Pao immigrated to France and died there in 2005. Col. Youa Pao Xiong served as battalion and regiment commander in the Long Cheng area. He later immigrated to Colorado, USA. Lo Seng started fighting the enemy alongside Gen. Vang Pao when the French were still in power. He attended the officer school together with Neng Chue Thao and Youa Va Ly. He eventually got to the rank of Colonel but then resigned to go back to grow rice like a common citizen in a farm located 52 kilometers away from Vientiane. No news was available from him, as he never left Laos. Col. Ly Lowas an important Hmong army officer in Houaphan Province. In 1971, he was the Commander of Regiment 26 that attacked the enemy in the Song Hack-Muang Kheung and the Plain of Jars areas. In May 1975, he immigrated to Thailand and initially refused to move to a third country. Eventually, he immigrated to the USA, where he died on December 23, 2007 in Hickory, NC. Song Leng Xiong was born in 1940 at Phou Sane, Muang Perk, Xieng Khouang Province. In 1947, he attended school at Phou Dou. From 1953 to 1955, he enrolled in the French Army as a commando trooper with the mission to secure Phou Vieng area. 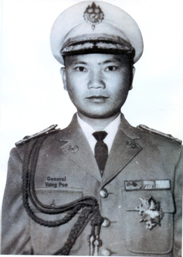 In 1960, during the Kong Le’s coup d’état, Song Leng Xiong rejoined the army as a sub-Lieutenant and was named Commander of Company 4, Battalion 201 stationed near Phou Vieng. From 1967 to 1968, he attended military staff training in Long Cheng, MR-II tought by Thai military instructors. During 1968 – 1969, he was appointed Commander of Battalion 209 and during 1969 – 1972, the Commander of Regiment 23. In 1974, when the SGU was removed, he became an officer in the Royal Lao Army. During 1972-1975, Col. Song Leng Xiong became Commander of the Operating Battalion in MR-II. On May 14, 1975 he left for the refugee camp of Nam Phong and in 1976 moved to Soune Vinay Center. In 1993, he immigrated to Minnesota, USA and, in 2005, moved to Florida. He said, “When I arrived in Florida, the atmosphere was happier and livelier than in Minnesota. I also feel healthier.” When asked why he felt that way, his answer was, “It is cold in Minnesota. I don’t have any chance to do any outdoor exercice like in Florida. The weather here is also not too different than in Laos.” But in 2008, he suffered a stroke and moved back to Minnesota for medical treatment. Apparently, Florida offered less health assistance to refugees than Minnesota. At the time, translation service was also almost non-existent in Florida. From 1973 to 1975, Col. Chansom Pardimonivong was Commander of the Houaphan military sub-region and Governor of Huaphan Province until the day he was sent to the re-education camp in Vieng Xay. He was released from the camp in 1988 and immigrated to France where he died in January 2006. During 1960-1976, Col. Thao Chai was MR-II Military Liaison Officer stationed in Oudone Thani, Thailand. He did not leave the area, and later died in Thailand. Photo #119. From L to R: Hang Xao (chief of MR-II Second Bureau), Burr Smith (US Military Attache), Shoua Yang (MR-II Military Commander) and Thao Chai (MR-II Representative in Oudone, Thailand). Picture taken on February 27, 1963 during their US visit at President Kennedy’s invitation. From 1964 to 1965, Col. Thong Vongrassamy was Commander of the Huaphan Military sub-region and the Governor of that province, replacing Col. Khamsao Keovilay. Col. Thong died in the battle front while on a mission to rescue an American pilot whose plane had been shot down. The American pilot was safely rescued but, unfortunately, Col. Thong was shot and killed by an enemy sniper while holding on to the rope that was dropped to rescue the American pilot. His body was later sent to Vientiane for funeral. From 1965 to 1969, Col. Phan Siharath replaced Col. Thong Vongrassamy as Commander of MR-II Huaphan sub-region, and Chaokhoueng of Houaphan Province. In February 1969, the enemy mounted a massive attack against the Na Khang camp (LS36). In the absence of outside military support, the camp fell into the enemy’s hand. Col. Phanh Siharath and most of his troops were either killed or injured. Col. Douangta was in charge of the Support & Benefits (“Sawatdi Karn”) services in Military Region II. He immigrated to California, USA in 1975 and then moved to Georgia. Both of them served as Liaison Officers in Vientiane to follow up with the news and report back to the MR-II’s military chain of command. Col. Khamsao was a Samneua native who has fought in the allies’ rank for years. During 1967-1971, Col. Khamkab was the Commander of the Engineer Battalion of MR-II and was later reassigned to Vientiane. He then lost all contacts with his former colleagues. During 1971-1975, he was replaced by Lt. Col. Thao Na, who never left the country. After the communist take-over, Thao Na was deployed to a construction site in the Plain of Jars. Since then, no more news was received from him. During 1965-1969, Col. Tou was the Commander of Battalion Savadikan MR-II. From 1969-1975 he was the adviser to MR-II, then refugee to the US living in Fmorida. During 1969-1973, Col. Bounnoi was the Commander of Huaphan MR-II sub-region and Governor of Houaphan Province, following the death of Col. Phang Siharath at the Na Khang camp (LS36). No more news about him since the refugee exodus. During 1972-1975, Col. Boualoy was named Commander of the Psychological Operations Battalion. No more news about him since the refugee exodus. Col. Sisavath was sent to the Sam-Tai re-education camp and later released in 1979. He immigrated to France where he stayed with his family until his death. Pol. Col. Phimphone was MR-II Chief of Police and died in that military region. Not enough information is available. Not enough information, except that he did immigrate to France with his family. Gen. Ai-Tam, a native of the Huaphan Province, served as Chief of the Second Bureau of the Royal Lao Army. He and his family first immigrated to France and then moved to Australia. Officers Of the Rank of Lt. Col.
Vang Neng, Vang Koua, Blong Thao, Youa True Vang, Mua Kao, Chong Koua Vue, Mua Seng, Yang Chue, Neng Youa Vang, Youa Vang Kao, Vang Yee, Youa True Vang, Moua Thong, Ly Nou, Neng Yi Yang, Chong Neng Vang, Cha Ly, Chong Toua Yang, Ly Neng, Lyblong Pacha, Seumphan, Ly Yeu (died in Denver, USA), Tou Vang Yang (graduated from Law School in Vientiane, now lives in France), and Thao Na. There were many more Lieutenant Colonels in MR-II, whose names escaped the author’s memory. Battalions BV21, BV22, BV23, BV24, and BV25 were stationed in Xieng Khouang Province, while battalionsBV 26, BV27, BV28 were stationed in Houaphan Province. In addition, there were also several commando battalions and village military guard units operating in MR-II. Military Thai instructors provided training to Lao troops in MR-II and created two SGU battalions, one to secure Xieng Khouang Province and the other one, to secure Houaphan Province. The first group included SGU 201, 202, 203 through 209, and the second group consisted of SGU battalions 226, 227, and 228. Starting in 1970, troops previously stationed in Houaphan Province were moved to Xieng Khouang Province. They were split into division two. The division included regiments 21, 22, 23, 24, 25, 26, 27 and 28 (8 regiments), and was put under the command of Col. Douangta. In 1972, Col. Vang Geu was the Commander of Division II, which was about to attack the Plain of Jars but had to stop short because of the Agreement signed between the US and North-Vietnam in Paris in 1973. Col. Ly Nou, Commander of Regiment 22 during 1970-1972. He died in the Vieng Xay re-education camp, in Houaphan Province. Col. Song Leng Xiong, Commander of Regiment 23 during 1970-1971. He was replaced by Lt. Col. Vang Youa during 1971-1972. After he was injured, Col. Vang Youa was replaced by Col. Ly Teng during 1972-75. 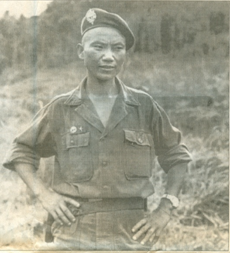 Lt. Col. Moua Kao, Commander of Regiment 24 during 1970-1973. Lt. Col. Vang Koua, Commander of Refiment 25 during 1970-1973. Col. Ly Lao, Commander of Regiment 26 during 1970-1973. Lt. Col. Chong Koua Vue, Commander of Regiment 27 stationed at Muang Mork (LS46) during 1973-1975, could not leave Laos and died there. Col. Cheu Pao Mua, Commander of Regiment 28 stationed at Bouam Long (LS32) during 1970-1975. In 1976, he returned to the battle field with his troops but died in the forest in Laos in 1994. Col. Vang Geu served as the chief of MR-II’s Development Office during 1973-1975. 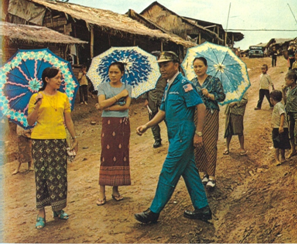 During 1973-1975, Col. Moua Sue was the Commander of Division II, with Lt. Col. Vang Neng as his deputy. The Divison’s command center was located at Sala Phou Khoune, at the junction of Highways 13 and 7. Russia increased delivery of ultra-modern weapons to North-Vietnam to help them fight back the US. (In 1971, US President Nixon decided to mine Haiphong harbor and send more troops to Vietnam). The US withdrawal led to many significant changes. It allowed Red China to become the main problem-solver in south-east Asia and signaled the dissolution of the communist world as we used to know it. It sent out a clear message to the communist world that the US would never get involved in Indochina’s affairs again. As a result, North-Vietnam was quick at making new plans to conquer Indochina in a way that would prevent any international intervention. They played the new game and used their military forces to gain absolute power and leave no other way out to the Lao coalition government. They gave Kaysone Phomvihane the authority to sign an agreement allowing the North-Vietnamese full control in all areas, leading to the arrest, detention and death of several hundred thousand of Indochinese in deadly re-education camps. All this, because Laos had limited resources, was a small country, and had practically no means to defend itself.